So I made the mistake of hooking up one of my RTiA9 towers as a center. 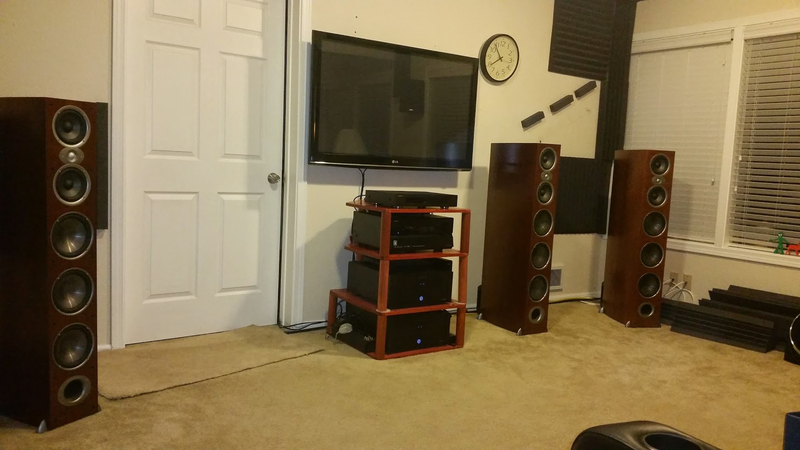 I was bored and was testing out some other tower speakers so they were not hooked up at all. It sounds so good now I don’t want to go back to a horizontal center. I am moving in the next 3-6 months and hopefully will be getting a dedicated theater space so it will be possible to make a tower center permanent. Now the tough part will be waiting. I have tried so many center channels and am always left disappointed, im just glad I finally tried the tower! It has been said ideally you should use the same speaker as your L/R for your center. Most people have a TV in the way. There’s so many factors that can effect performance of a system you just can’t imagine the difference it makes unless you try it yourself. Most of the houses I’m looking at have either a basement or bonus room. My plan all along has been to build a false wall to have easy access from behind for equipment, so if I get either room it will be the perfect time to make it permanent. I have been auditioning the rtia9 against the klipsch rp8000f. I like the rtia9 Over the 8000f but not satisfied with the csia6. Before shipping back the rtia9 I figured it was worth a try and it is night and day for me personally. Looks like I’ll be shipping klipsch speaker back. The RtiA9 is a tall tower. It's possible that when you experimented with it, it was situated in a higher position than was the csia6. Perhaps it was the elevated stage that made the noticeable difference? They're timbre matched, so I'm trying to understand what would differentiate the two other than placement and of course bass response. But I doubt bass response was the selling point for you. My tv stand is somewhat high so the center placement is within 6” of tower. Main thing I could think is the mid drivers not being ported like the csia6. I don’t have any experience reconfiguring components. Seems like any of the rti towers might sound good as well. I’m looking forward to using an a9 for my Center. This is the way to go if you have the space. It's how it's done at movie theaters. If you have the space and you're going all out, the best case scenario is building a soundstage with a full audio transparent screen. It's a hard sell to give up that much square footage at home, but it really is ideal. Matched towers and the subs all behind the screen. Having 3 timbre matched vertical speakers up front is the ideal. In my case, I did it with LSiM 705s for L&R and a 703 on my cabinet for the center, with all tweeters at ear height. 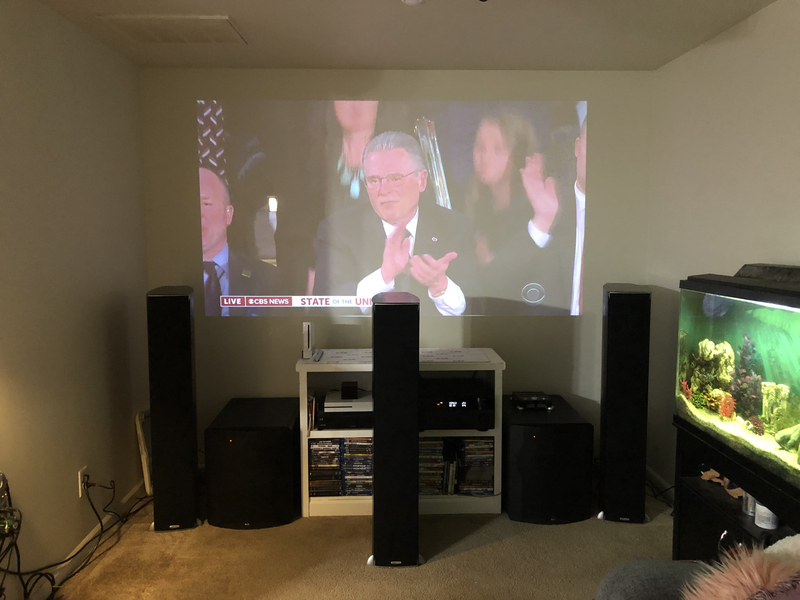 This does require that your TV or screen be about 7" higher than with a horizontal center, but the improved front soundstage was worth it for me. 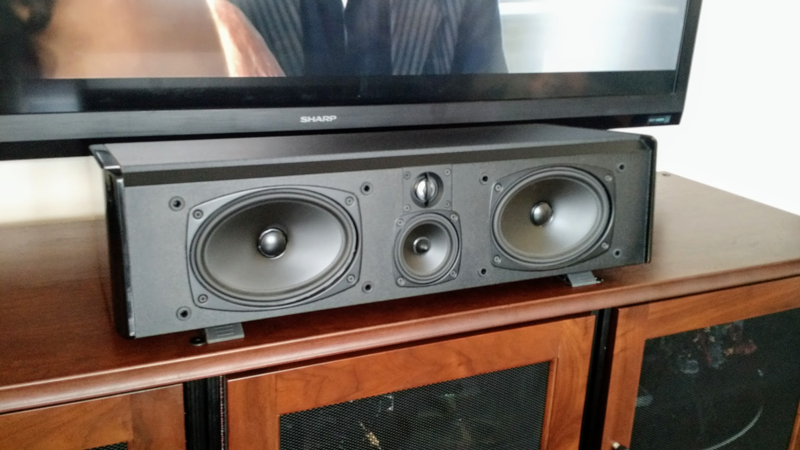 As far as horizontal center channel speakers go, the 3-way LSiM706 is pretty good. I think only an optimized horizontal line array can best its design. Going with a matched vertical speaker is of course the best option for a dedicated theater. Using the 703 for a center is a pretty good idea shs. I’m very happy with my 706c and think it compliments the 705 really welll. I’m still looking for a tv stand to accommodate it. 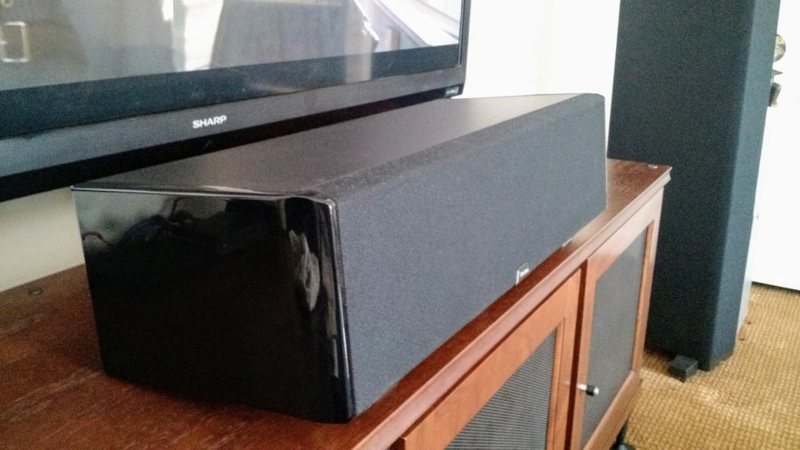 Might get something with a built in mount so the speaker can sit right beneath the tv. Where did you buy yours from? Yes double boxed. No issues whatsoever with the center. Arrived in pristine condition. My tower had a loose PowerPort, but that was easy to put back in. I believe any of the issues in shipping may be blamed on Fedex or UPS. I've had a few center channel speakers, the Polk CS400i, CS1000p, LSiM706c, Chane A2rx-c, Boston Acoustics VR910 and VR920. I've tried them lower on a stand as well as in a center channel compartment. I found I got the best vocal height / anchoring, and uncolored sound with the speaker on top of the TV stand, slightly tilted, at the edge of the stand. I mounted my TV to the wall. Possibly going to be able to get vertical tower. Gonna buy another one and if I can’t make it work now I’ll just wait. Really just need to get 2 slim media towers to flank each side so it’s symmetrical. As far as tv height, the way my couch sits and my head is angled my center point has always been just slightly above midpoint on 8’ ceilings. So not worried about that part. Don’t have the media towers to go to each side yet but this is what it would look like. I will have to adjust screen up a few inches. I tried if for awhile, my off axis was a bit too off. When I have the space, I have a 4th, the extra pair serves as wides. You tried the tower as a center and didn’t like it? Or that’s your current center? I liked it, due to space constraints, I pulled it. Providing I had the space, I would run the A9 in just about every position. I've had a pair as rears and on stands, wow, very dynamic. So for now, I remain with a 706 at the center's helm. If space isn’t a concern do you like the rtia9 or 706 better as a center? I would use the A9's straight across if I could. Have you compared to any other speakers? I have some Klipsch at the moment too. To me both have pros and cons. The main difference is how in your face the klipsch is and how laid back the polks are. I don’t really consider the klipsch bright it’s just very forward. I haven’t spent enough time with both to decide what to do yet. I’m also moving soon and may have two separate spaces so not sure what I’ll do in terms of if I’ll send anything back. Have you compared to any other speakers? It's been awhile since I've compared to any other speaker brands. I've heard the Klipsch, not my cup of tea. There may be a day when I grab a pair of 707's, but not committed yet...….. I've been more than satisfied with my RTiA set up. As far as I can see, I'll keep it as long as I'm able. Having two separate spaces is what I'd love to have. One for H.T, one for music.....ah if only. I'm sure you'll make the most of your space!! It seems like the rtiA speakers just suite my ears best. I’ve tried a lot of good speakers and heard a lot as well, but for the price and overall balance I think the rtia series is gonna win for me. At the prices they sell I don’t think it can be beat, if it were retail prices then it may be a different story. If you build a Wall to hide all 3 speakers, this would be ideal situation and a Micro Perf Screen. This way you can have your Floor standing speaker as a center and not have to change the position of the screen. The screen should be properly placed in your room, not work around the speakers. Also take note that if your not happy with a center channel especially one that is designed and matched to your main channel speakers you have both placement and setup issues. Your not crossover over properly or calibrated. You are also not positioning and aiming the tweeter correctly. Little things like this make huge improvements in ones system. In all my decades of setting up theater rooms never once did I feel the center channel of the given system was a weak link. betting the fish in that tank get a hoot out of the subs! !